The AIRAID 201-104 fits some Chevrolet Blazer, Chevrolet C1500, Chevrolet C1500 Suburban, Chevrolet C2500, Chevrolet C2500 Suburban, Chevrolet C3500, Chevrolet C3500HD, Chevrolet K1500, Chevrolet K1500 Suburban, Chevrolet K2500, Chevrolet K2500 Suburban, Chevrolet K3500, Chevrolet R10 Suburban, Chevrolet R1500 Suburban, Chevrolet R20, Chevrolet R20 Suburban, Chevrolet R2500, Chevrolet R2500 Suburban, Chevrolet R30, Chevrolet R3500, Chevrolet Tahoe, Chevrolet V10 Suburban, Chevrolet V1500 Suburban, Chevrolet V20 Suburban, Chevrolet V2500 Suburban, Chevrolet V30, Chevrolet V3500, GMC C1500, GMC C1500 Suburban, GMC C2500, GMC C2500 Suburban, GMC C3500, GMC Jimmy, GMC K1500, GMC K1500 Suburban, GMC K2500, GMC K2500 Suburban, GMC K3500, GMC R1500 Suburban, GMC R2500, GMC R2500 Suburban, GMC R3500, GMC V1500 Suburban, GMC V2500 Suburban, GMC V3500, and GMC Yukon models. See vehicle applications for details. Very satisfied with the product and especially the customer service. I ordered a product that was not CARB certified and they called me to correct the order so that the new system would be California smog compliant. Great insight to catch my error. 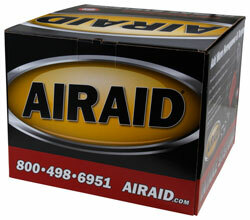 If ever I need another air intake product I would go to AIRAID first and foremost.